JOHN HOLWAY’s daughter Grace married in East Buckland, probably sometime before 1664. From this we may deduce that his children were born around 1640 and he himself would be born in the early years of the 17th century. There were Holways in East Buckland long before that. East Buckland is a village between Barnstaple and Exmoor. The registers only go back to 1684, so it is difficult to establish family patterns before that. In the 1569 Muster Roll, Thomas Holway is one of three men presenting the roll for East Buckland. He is also specially charged with providing armour and weapons, as one of the wealthier parishioners. John appears to have come from a prominent and comparatively affluent family in this little village on the southern foothills of Exmoor. It is likely that his father was another John Holway. We do not know when he married or the name of his wife. There are possible marriages nearby. The South Molton name looks more likely. There are no baptisms in South Molton for children of John Holoway following this marriage, nor in Bishops Tawton for the first two marriages. But the wedding may have taken place in a parish such as East Buckland, whose early registers have not survived. There were then five men in East Buckland with that surname: John, John junior, Paul, Philip and Richard. Probably none of John’s sons would have been old enough to take this oath of loyalty to the Protestant religion. All males over 16 were required to swear. This makes it likely that he was John Holway junior. Probably John Holway senior was his father. The other three could have been brother, uncle or cousin to him. By the 1664 Hearth Tax, there were three Holway men heading households in the parish. 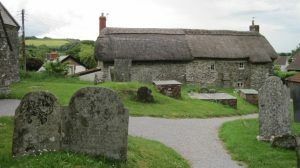 John Holway and Anthony Southcombe were jointly occupying a house with five hearths. Philip Holway had three, and another John Holway one. Since Anthony Southcombe was Grace Holway’s husband, we can assume that father and son-in-law were sharing this large house. Five was the highest number of hearths for the parish. Out of the twenty households listed, only four had this number. At some point, John moved from East Buckland to the little village of Charles, a mile further north. It was in the rectory here that R.D. Blackmore later wrote much of Lorna Doone. His novel is set on the eastern side of Exmoor. It was in Charles that John died, in or before 1682. There was a dispute over his will, involving Anthony and Grace and John’s grandson, John Buckingham. Citation of Anthony Southcombe & Grace his wife of East Buckland dau. of John Holway late of Charles decd to show why caveat by them interposed in goods of deed should not be revoked & the will proved at promotion of John Buckingham grandchild by a daughter of decd & exr named in will. The fact that he named John Buckingham as his executor may show that he was now closer to his grandson than to Grace and her husband. He may have been living with or near the Buckinghams, or have had a particularly liking for their son John. The Charles registers begin much earlier in the century than those for East Buckland, though they were discovered in a barn and some pages have been affected by damp. No record has been found in them of John’s burial. Since the two churches are only a mile apart, he was probably buried in East Buckland with older generations of the Holway family. His death would have been just too early to be included in the surviving East Buckland registers. We have no information about the name of his wife. The fact that she is not named in the dispute over his will means that she probably died before him. In 1777 there was a document transferring the title of Westacott in East Buckland from Buckingham to Hollway and others. And in 1836, another conveying Boundy’s Wood in Charles from Hollway to Hollway. We have no way of knowing whether these formed part of John Holway’s estate in the 17th century. Westacott lies about ½ mile SW of the East Buckland church.